This site is a companion to the Managers of Their Chores book by Steve and Teri Maxwell, and the content on this website is for book owners. How has your chore system been working in your family? We want to know! Please let us know your experiences, here. Don't have the Managers of Their Chores book? Is your family struggling with chores? Maybe you currently have a chore system in place but you’re still having problems. Should children be expected to do chores? How many chores should they have? What age do we begin assigning chores? How do we encourage our children to accomplish their work? Is there a biblical basis for chores? Do chores bring benefits or burdens to our children? From the chore challenged to seasoned chore warriors, Managers of Their Chores offers chore motivation, practical help, and an introduction to ChorePacks. Click here to learn more about the book! 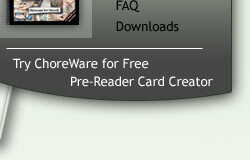 We have just released ChoreWare! In a nutshell, ChoreWare is an online software that helps you to quickly and easily create your chore system, as a companion to Managers of Their Chores. Find out more. Click here to subscribe. Our easy-to-use Managers of Their Chores forms are available to download! Click here! Would you like to make your pre-reader picture chore cards? You can do it in a few simple steps. Click here to start! ChoreBoard is a forum to encourage each other in developing a ChorePack system. An incredible software designed to help you design your Managers of Their Chores ChorePack system. Available to book owners for a fee of $12 per year. Order Refills for Managers of Their Chores! Are you starting your school year with an updated set of ChorePacks? We now have refills kits available to you from Titus2.com, so that you can get your revised system up and going with a fresh start! Order the Chores Workshop CD! Would you like to hear Teri’s session on Managers of Their Chores? It is an encouragement for ladies as they begin their chore system. Click here to order it (available to book owners). Purchased ChoreWare with Managers of Their Chores on Titus2.com?